Submitted by dennis on Saturday, July 5, 2014 - 7:32pm. My family got together and wanted to go out and eat somewhere new and different. With the exception of all you can eat Korean BBQ, they had no other experience with other Korean dishes. So I recommended to them my favorite Korean restaurant, Do Re Mi! Conveniently located on Clairemont Mesa Blvd. near the 163 freeway, this restaurant is outside of the Convoy Asian restaurant bubble which makes parking easier to find. The only problem you might run into though is that this restaurant is pretty small and depending on what time you go, you might have to wait in line for a while. Fortunately for us, we had arrived here right when they had opened for weekend lunch. There were a few people who eagerly waited ahead of us but there was plenty of seating at this time. One of the reasons why I like this place is because they give you an amazing selection of complementary Side Dishes. They will refill each plate as it empties and my friends and I usually plow through two rounds of these by the time we finish our meal. I think we typically receive a few less dishes when we visit but since we came in a large group this time they brought out several more. 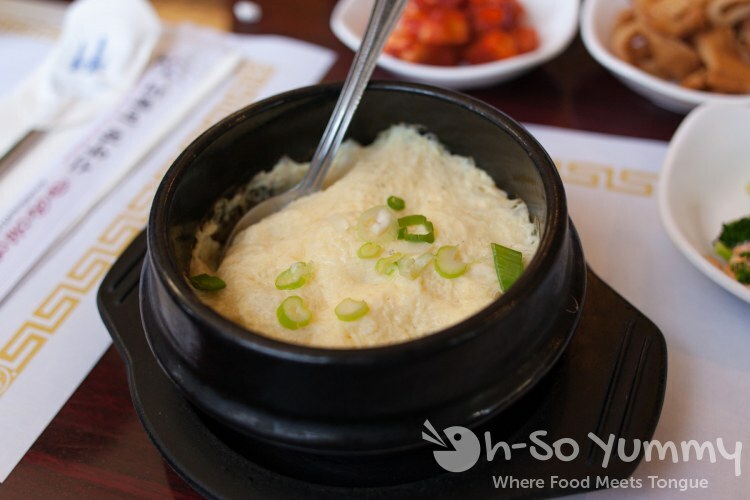 The Steamed Egg they brought out for us was fairly simple but has a subtle sweetness about it which makes it quite nice. There wasn't that much to go around but we had enough to get a good taste. 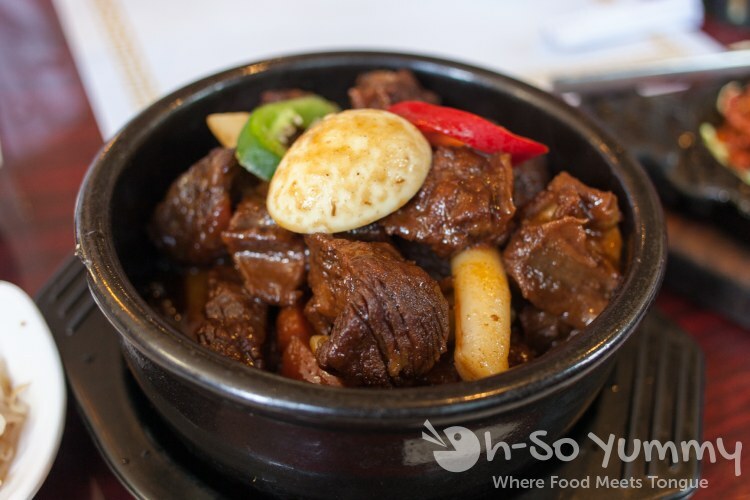 The Galbi Stew (Braised Short Rib Stew) is another great item they serve here. The pieces of meat are so incredibly tender and flavorful. Because we enjoyed this item so much, we didn't get to try much else the first few times here. I'd say we order this 80% of the times we come here, even now. The stew itself is quite rich and fatty. Because of that, I don't drink it like I would with any other type of stew. Instead, I just pour it over a bowl of rice and eat it along with other dishes. Other ingredients in this stew include egg, potato, and dokbokki (thick rice noodle). The Premium Galbi came out slightly overcooked and chewy. It was such a disappointment because I know they've made it better the other times I have tried it. 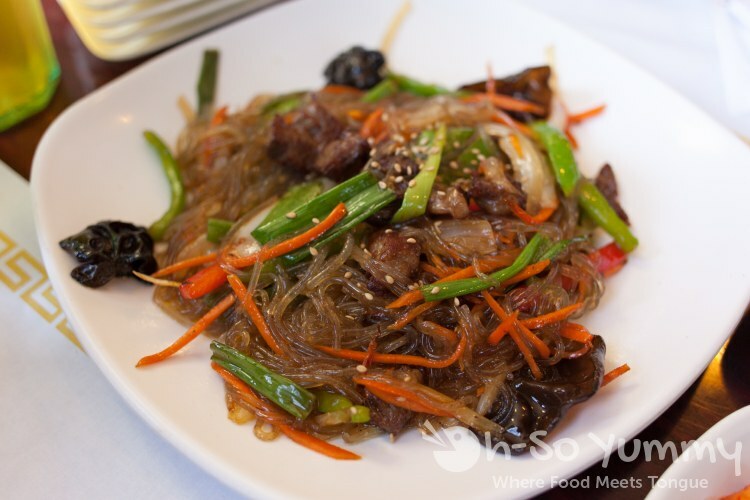 Japchae is Lynn's favorite dish here. It has the right amount of sauce and combination of meats and vegetables. Other places we've been to either put too much sauce on the noodles which makes the flavor too heavy or they don't add enough meat. 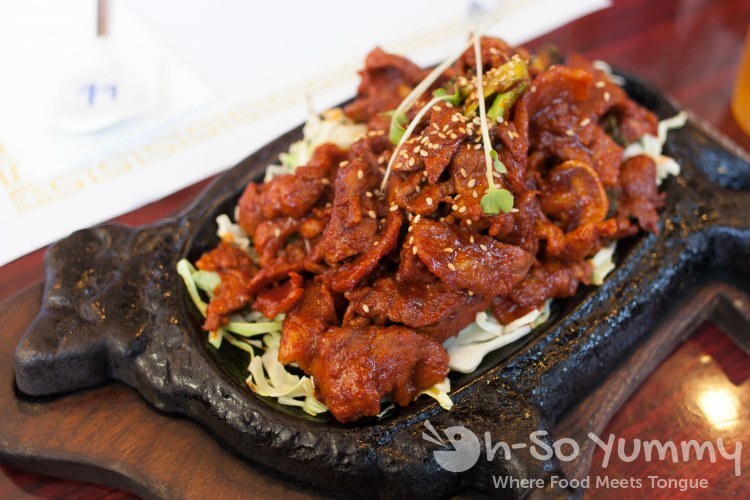 Spicy Pork Bulgogi is one of my other go-to items when I eat here. 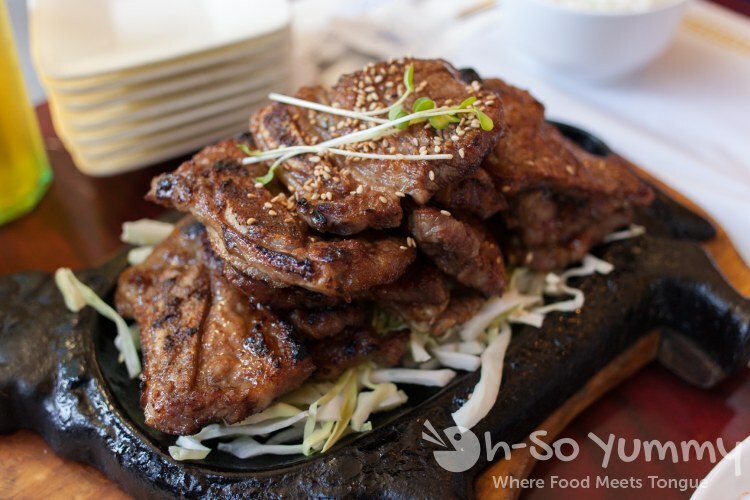 I know you can easily buy this type of meat marinated and ready to cook at Korean supermarkets, but for some reason it always seems tastier at restaurants! Perhaps they use some kind of secret marinade recipe or a higher grade meat than what you can buy at the market. Or maybe things just taste better when somebody else cooks it for you... I'm sure home cooks out there will disagree on that comment. The pork pieces are not that spicy as Lynn is able to handle it. I also like how it's on a bed of cabbage which allows the oils to drain toward the bottom. This way the bottom pieces of meat aren't soaked with oil. 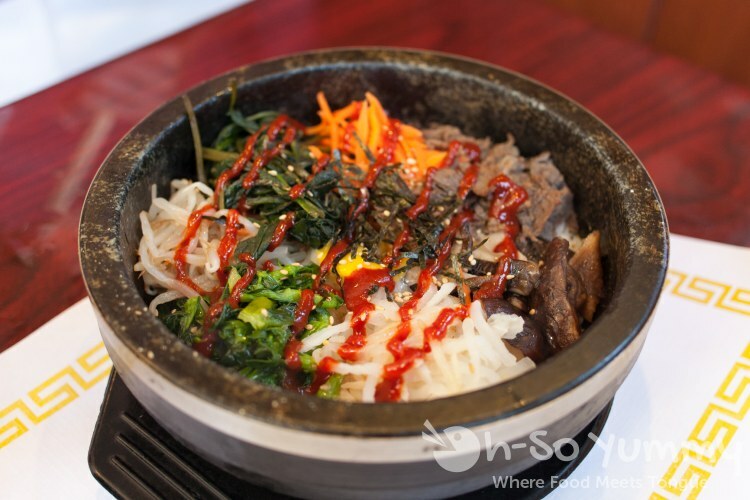 If you plan to go here by yourself then I suggest ordering Dol Sot Bibimbap as you get the best bang for you buck. 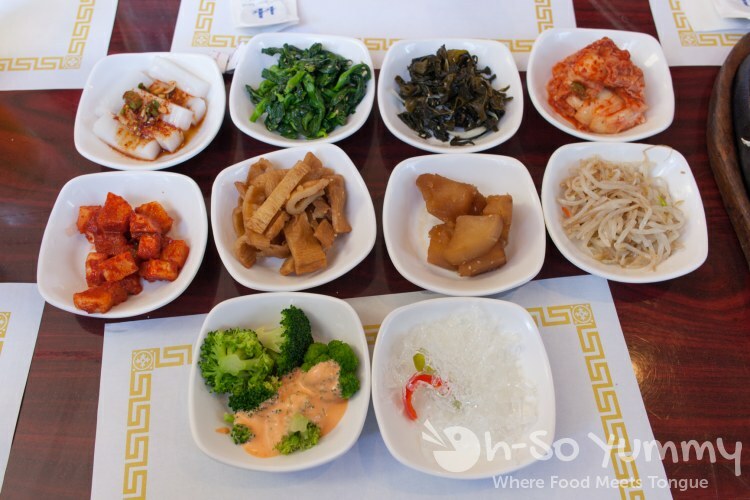 It is quite filling and you get a great variety of ingredients that are meant to be mixed together with the bibimbap sauce provided on the side. There are two versions of the bibimbap here and I prefer this one which is served over a bed of rice in a stone pot. The heated stone pot causes the outer pieces of rice to crisp up a little and keeps your food temperature amazingly hot throughout your meal. We ordered an appetizer of Fried Chicken Wings which was good but nothing extraordinary. Still, they were better than a lot of the wings I have tried at bar restaurants. I feel like they need something like butter or salt and pepper to really stand out. 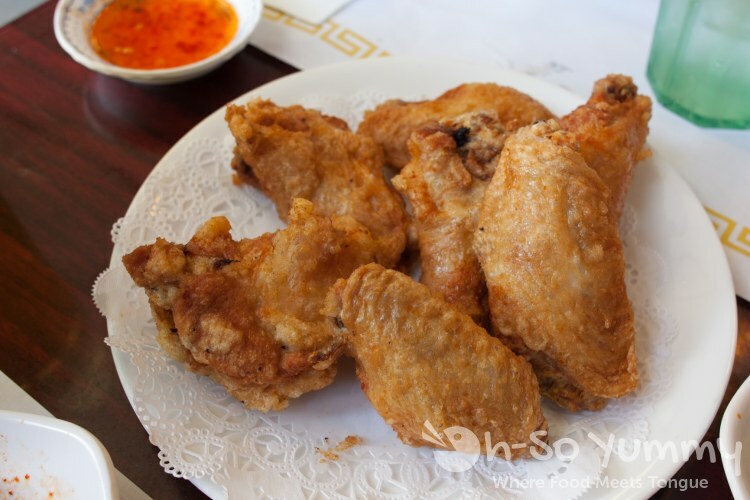 We also ordered Fried Spicy Chicken Wings to try out. The added chili makes a world of a difference compared to the regular Fried Chicken Wings and is an instant favorite. 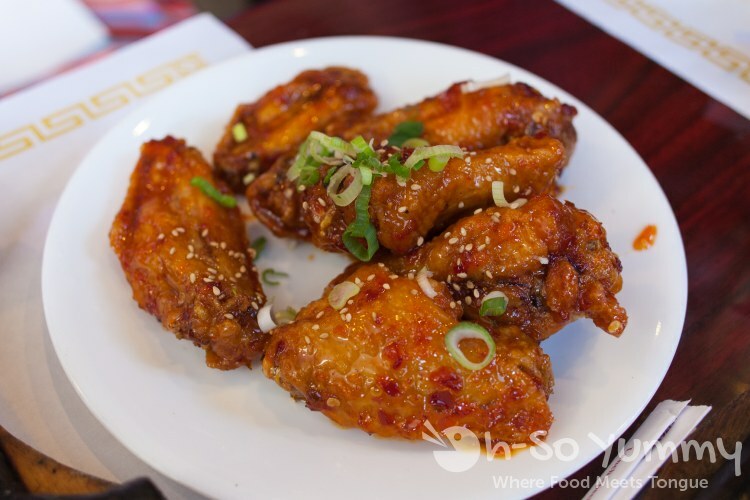 Although it is covered in the sweet and spicy chili sauce, the wings remain crispy. For some reason these wings came out extremely hot (temperature) compared to the regular fried chicken wings and we had to wait a while for it to cool down before eating. Tofu Soup (possibly with seafood?). The soup was boiling for the first few minutes after being served. This is also the time where if you wanted to crack a raw egg into the soup to allow it to cook. I didn't get to try this one but my brother-in-law said it was quite good and "hit the spot." Overall my family was quite satisfied with what I had ordered for them. We even had some food leftover which I was able to claim and eat for dinner that night. Score! As mentioned earlier, this restaurant is small. They only have two tables that are large enough to accommodate a group of about 6-10 people. So if you plan to go here with a large group then you better make sure somebody comes early and gets a name down on the waiting list as they do not take reservations. If you go in a group of four or less though you should be fine. Never been to Do Re Mi but I've been looking for a good bi bim bap spot. We like our Korean bbq at Dae Jang Keum but have yet to find a solid bi bim bap spot!! I was so sad I missed this particular outing! I wanted galbi stew or japchae... Nothing in my mind sticks out as the 'bi bim bap' spot so I can't really suggest anything in particular. I haven't tried Dae Jang Keum but I'll check it out as long as it's not AYCE! I like this restaurant quite a bit too. I never received the egg custard when I ordered a lunch special though. I have always wanted to try that beef stew - what is that white oval thing on top of stew - it looks like half an egg? I agree the galbi can be dry there. I've seen the wings on the menu but always declined to order (as I had the banchan). But your pics of the wings makes me want to order them next time I visit. We finally got our post up! Dennis ended up writing it because I was too busy. I went for lunch once last month but the bulgogi bento box wasn't very good (and neither was the picture). I would recommend sticking with the hot plate instead. 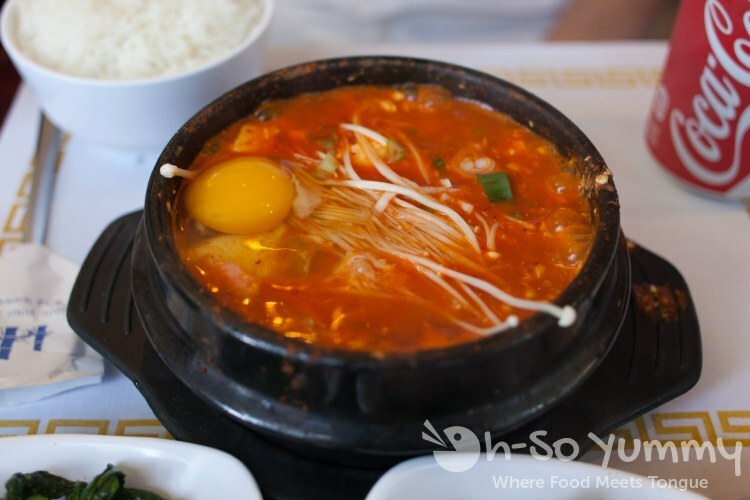 The white oval thing in the galbi stew is indeed an egg!